If it there is one thing the newspapers leap upon it is a terrible tragedy with a villainous scapegoat. There has been so much to keep them going as we enter the so-called 'silly-season' where the press are left with nothing to occupy them as Parliament goes on recess. First there was the BP oil disaster (post of scapegoat unfilled), then there was the Cumbria shootings (scapegoat identified and knee-jerk calls for gun control outlined) and the latest story the two babies attacked by a fox. It isn't that these aren't awful stories, they are... these sorts of tragedies need press coverage. The problem is the immediate need of the press to find someone to blame and before being in possession of full facts start putting forwards solutions (sensible or otherwise). A little restraint and measure is needed in the reporting by the press and the reactions from, well, just about everybody. This fox attack, for example. Even the press was hard-pushed to find many other examples of such a thing, two I think they managed. It is rare. So rare that after initially reported it turns out to be something else. Foxes are shy and timid animals. 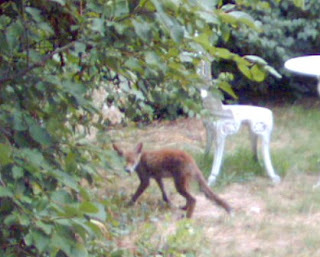 I know because as long as I have lived at my present address (in the suburbs of London) I have shared my garden with foxes. A family of foxes, in fact. They enjoy playing in the garden at dusk and after dark; and raiding bin bags foolishly not put in bins. When they see a person though they freeze... and won't tolerate less than a good few feet between you and them. Startle them and they vanish. Now Boris is calling for a cull of urban foxes. Please don't! These creatures have been forced into their urban habitats as they countryside homes are destroyed as hedges are ripped out and copses and similar destroyed. Yes they are pests sometimes - the ones that live in our garden are in disgrace for their enthusiastic excavation of my flower box; they are also beautiful and elegant creatures.